This song was not used as the music for a Psalm, After all, it really is The Beatles’ song (to which I only added words for verses 3 & 4 and C2 & C3). In December of 2002, the Nottingham Country Ward Relief Society approached me about singing for a Relief Society Dinner. I didn’t tell Andrea. I wrote this song about The KeyNotes, The Beatles, her family garage where we had the first band member meeting, about her being our only groupie, when we were ages 14-18 and she was ages 9-13. I was pretty comfortable plagiarizing other people’s songs and words by this time, and so the song is a parity of The Beatles famous “I Wanna Hold Your Hand.” As I recall, there were about 20 of us that met at Randy’s (Shirts, Andrea’s next older brother) garage within a week of The Beetles coming on Ed Sullivan in 1964. Sometime after that, there were 5 of us who became The KeyNotes: Randy Shirts, myself, Ray Gardner, Dale Hatch, and Charlie Garfield (as labeled on the only photo I have of The KeyNotes to the left). Charlie was our best singer, and so he became vocal. We were not very good, and we got better over 4 years. I kind of became the leader, and when Dale was too busy with sports, I was elected to give him the bad news he was no longer in the group. We then became – thanks to Randy’s name – The MydKnight Hour. 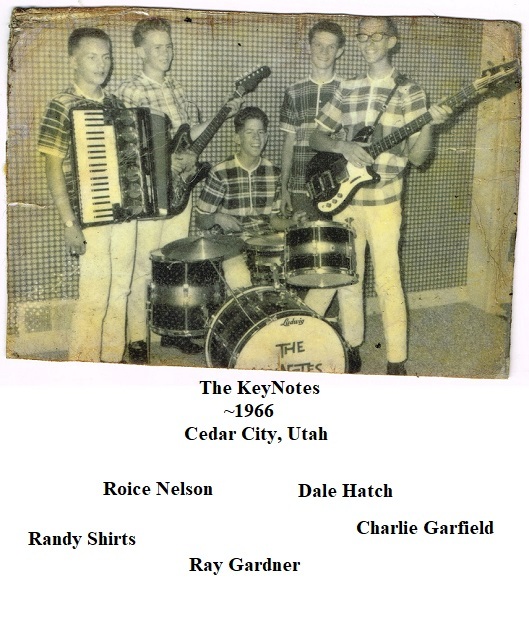 Our first professional gig was for a minimal amount, an amount which did not even cover gasoline, at my cousin Roice Nelson Krueuger’s High School in Loa, Utah by Capital Reef (where his Dad was the Managing Park Ranger). We built a trailer to hall our drums, amplifiers, guitars, accordion, sleeping bags, etc. We lost one of the sleeping bags before we passed the bottom of the farm on Minersville Road, and it was later given back to us. 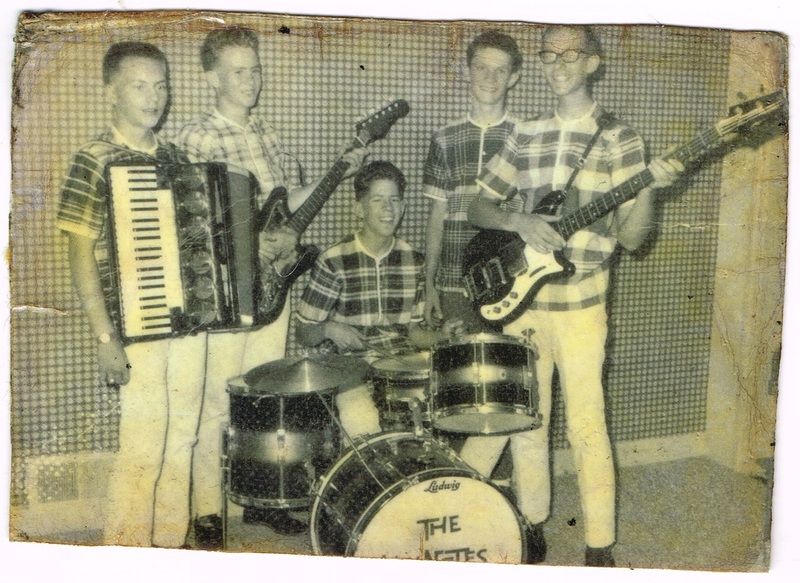 We later played in Milford, Parowan, had a beach party at Rush Lake, The Hotel El Escalante, South Elementary, Virgin Valley, The Dixie Roller Rink, and other places I do not remember. We built the first strobe light in Cedar City in 1967, using my erector set motor. We paid for a light board, which had a dozen flashing colored flood lights. We had a lot of fun, some heartache, and learned a lot. And to think, Andrea was our only groupie.